Construction Begins on the Northend Greenway! Never have we been so excited to see silt fencing and a swath of cut trees. Yesterday we ventured out to Mount Clinton Pike to take a look at the very earliest stages of construction on a project that our bike/walk community has been talking about since 2010. The Northend Greenway is a powerful example of citizens looking around their community and recognizing the need for connectivity projects that may have been missed by local government. Through grassroots work, citizen advocates led by New Community Project (Vine and Fig) successfully organized to encourage the City of Harrisonburg to recognize the need for the project and begin work on making the project a reality. Community pressure succeeded in securing funding for the project and move it up on the list of priorities for the City. For a number of reasons, getting the project off the ground proved much harder and more complicated than originally anticipated. Through the entire process, the bike/walk community continued to push in order to ensure the City honored its promise to build a greenway connection from Downtown Harrisonburg to Eastern Mennonite University and to the north end of town. As 2018 wraps up we want to celebrate the tireless work of the many advocates who succeeded in conveying their vision for a network of greenways throughout our region. Through persistence, patience, and sheer tenacity our community succeeded in preserving a stretch of green space along Black’s Run for a greenway to provide walk/bike connectivity separate from cars. Unless something extraordinary takes place, we will see construction wrap up on phase I of the Northend Greenway in 2019. Then what? Vine and Fig are planning a community build in early 2019 for a portion of phase II near the Salvation Army on Jefferson St. Stay tuned for announcements and be sure you are signed up for our email newsletter to stay in the loop on upcoming dates. You can look at the detailed map and see all phases of the Northend Greenway by clicking on this map. We won’t stop with the Northend Greenway! There are plans in the works for more greenways in and around Harrisonburg such as the Connect Our Schools project and with a bit of luck we could see construction start near the end of 2019. 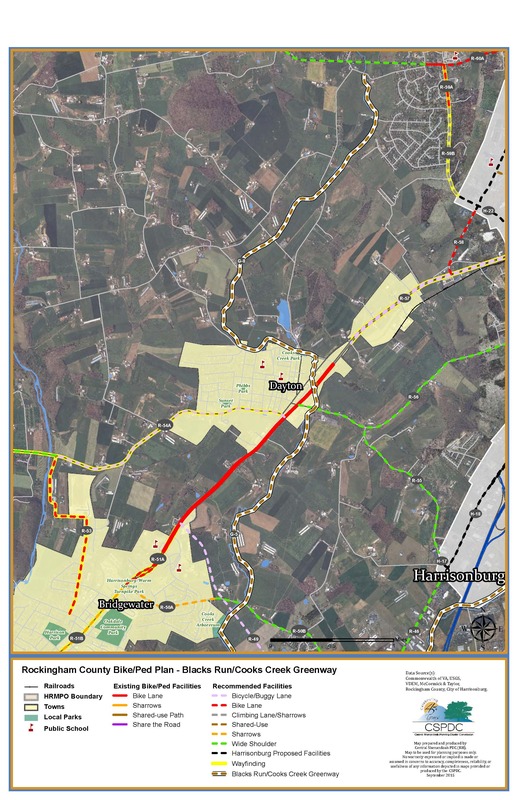 This project would connect Westover Park to Thomas Harrison Middle School to Hillandale Park around Heritage Oaks Golf Course to Harrisonburg High School and Bluestone Elementary. when completed, the project will serve over half of the City of Harrisonburg Public School students and will represent the single largest investment the City of Harrisonburg has made in a bike/walk project. We also can’t wait to start talking about the Cooks Creek Greenway project to connect the Bluestone trail to Mt. Crawford, Bridgewater, Dayton, and back into the City of Harrisonburg through the Belmont Neighborhood. Haven’t heard of it? We are just starting to spread the word. You can look at a very rough conceptual map of the Cooks Creek Greenway by clicking here. First priority is to secure the extension of the Bluestone Trail further south to reach the new Harrisonburg High School.